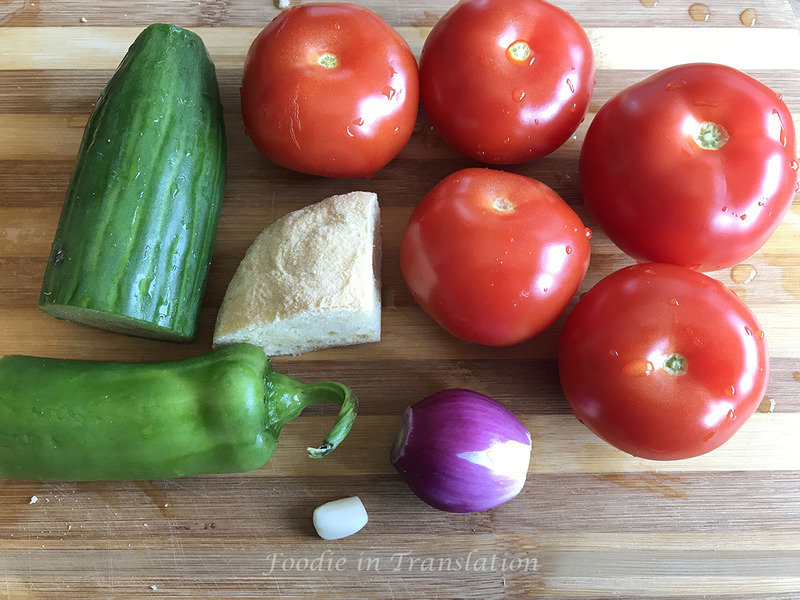 I had a relatively bad experience with this Spanish recipe: the gazpacho Andaluz. The dish tasted very good by itself. I only ordered it in the wrong day. We were in one of our favourite Spanish restaurant, or better, an Andalusian restaurant, to celebrate my partner’s birthday. I decided it was time to order a cup of gazpacho, even if it was quite a chilly summer night. Unfortunately, I really couldn’t enjoy it at its best. Because you need a very hot day to enjoy gazpacho. And I can assure you, it will definitely refresh your day. After some years, I wanted to prepare it by myself and here we are. This is why I made it some days ago, during an unusually 35° C hot day in Paris… we devoured it and it was really perfect!! Peel the garlic clove and the onion. Cut in 4 pieces the tomatoes and the onion. Slice the cucumber and the green pepper. Cut the bread in pieces. Put all these ingredients into a blender and blend them, until everything is smooth. Add olive oil, a pinch of salt and vinegar. 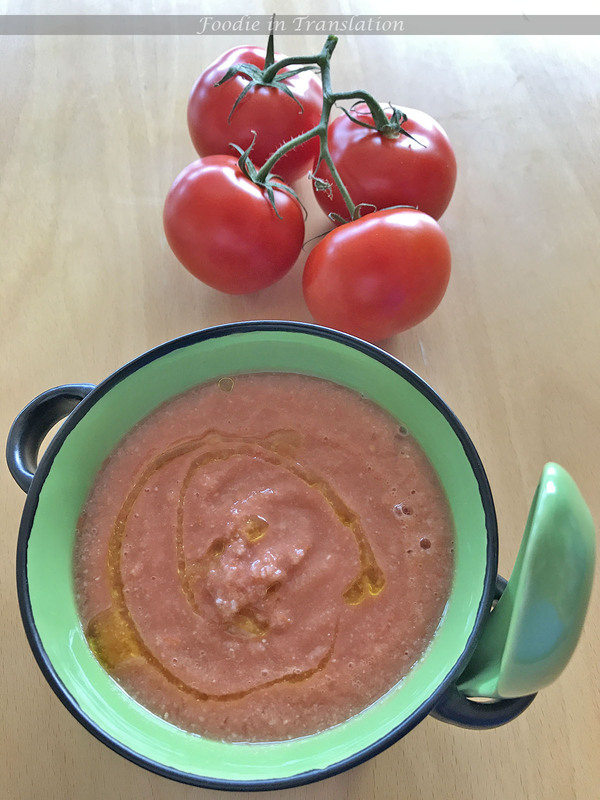 Blend again and taste the gazpacho: if the seasoning is ok, your gazpacho Andaluz is done, otherwise you can add another tablespoon of vinegar and a pinch of salt. If it is too thick, add a bit of water. 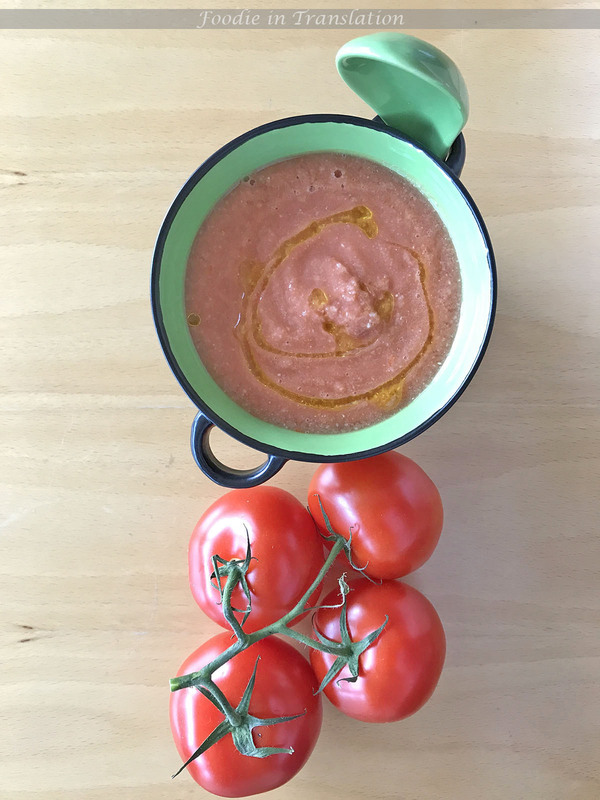 Your gazpacho andaluz is ready! Serve it in a cup, pour a drizzle of olive oil and that’s is!